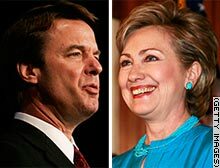 MANCHESTER, New Hampshire (CNN) -- Sen. Hillary Clinton's double-digit lead in the key primary state of New Hampshire has eroded substantially since February, while John Edwards has moved closer, according to a poll released Tuesday. The CNN/WMUR presidential primary poll, conducted by the University of New Hampshire, found that Clinton was the choice of 27 percent of likely Democratic voters in the Granite State, down from 35 percent in the same poll in February. Meanwhile, Edwards, who was the choice of just 16 percent in February, saw his support jump to 21 percent, vaulting him past Sen. Barack Obama into second place. The latest poll was conducted after Edwards and his wife, Elizabeth, announced her cancer had returned. When likely Democratic voters were asked what effect that announcement had on their view of Edwards, 85 percent said it had no effect, while the rest were almost evenly split over whether it made them view him more or less favorably. However, when likely Democratic voters in New Hampshire were asked whether they viewed Edwards favorably or unfavorably, the poll found a roughly 10-point shift in his favor since February. Eighty percent said they had a favorable view of Edwards, the party's unsuccessful 2004 vice presidential nominee, compared with 8 percent who viewed him unfavorably, a margin of 72 points. In February, 74 percent had viewed him favorably and 13 percent unfavorably, a margin of 61 points. Meanwhile, the poll showed Clinton's favorability took a significant hit during the same period. In February, she was viewed favorably by 74 percent of likely Democratic voters in New Hampshire, while just 15 percent viewed her unfavorably. But in the latest poll, her favorability rating shrank to 64 percent, while the number viewing her unfavorably climbed to 24 percent -- a net shift of 20 points. Obama's favorability remained largely unchanged from February, with 69 percent viewing him favorably and 10 percent unfavorably. The only other candidate with double-digit support among likely Democratic voters in New Hampshire was former Vice President Al Gore, at 11 percent, even though he is not currently a candidate. New Mexico Gov. Bill Richardson was the choice of 4 percent, and Sen. Joe Biden of Delaware was at 2 percent. Sen. Chris Dodd of Connecticut and Rep. Dennis Kucinich of Ohio were the choice of 1 percent of those polled. Twelve percent of those polled said they were undecided. Asked what issue was most important to their vote in the primary, 39 percent said the war in Iraq; 21 percent, health care; 11 percent, the economy; 7 percent, foreign policy; and 4 percent, education. A new CNN/WMUR poll shows an increasingly close race between Democratic presidential contenders John Edwards and Hillary Clinton.